Happy Cassette Store Day, all. 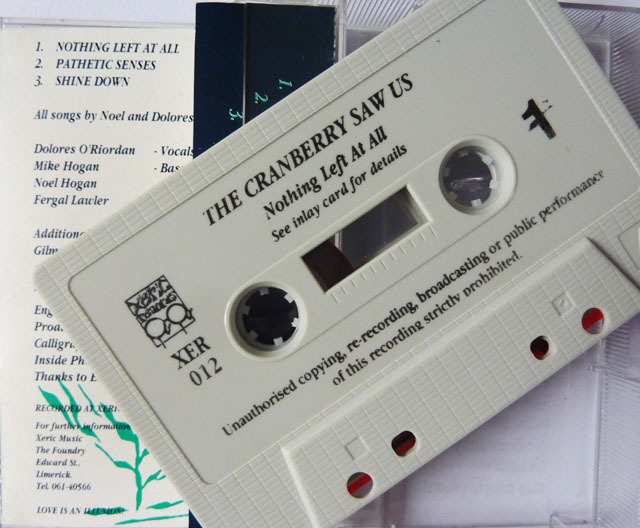 Currently reeling on the Dig With It tape deck is a 1990 release by the Cranberry Saw Us, indie combo from Limerick. Say it quickly and you might figure the pun, a legacy from former singer and jape-meister, Niall Quinn. His replacement was Dolores O’Riordan, who soon came up with a song called ‘Linger’ and The Cranberries were off. This, then is a transitional moment, their first commercial release after the ‘Water Circle’ demo. The guys are big into The Smiths, all mordant spaces and guitar arpeggios. There were maybe a hundred bands in Ireland all working this seam. But they didn’t have Dolores, shy girl, not savvy about indie rock, battling weight issues, eating maybe a dozen packets of crisps a day. She wasn’t awful happy in her own skin and there was a twisted relationship behind her. Not so good for Dolores, but a bit of a win for local music because she sang very intensely. Even at this point it was impressive. Elsewhere in 1990, Sinead O’Connor was ruling America with that second album, but O’Riordan was a useful understudy. Both of their voices were somehow informed by the church and by traditional music. They were not averse to the see-saw vocals, ululating at the end of lines. But while Sinead was fierce by default, Dolores was inward, hesitant, affecting. Two of the tracks, ‘Nothing Left At All’ and ‘Pathetic Senses’ would be revised for the 1991 ‘Uncertain’ EP. But even in this state, you can witness the sense of self. The teen absorption, the tremendous misery that rises over the dumb lyrics. Millions of Americans would come to adore all this and Dolores would evolve into a whole other character. But she was never so beautifully gauche again, and here it is, preserved on ferrous oxide, one of 300 copies, your actual spools gold.